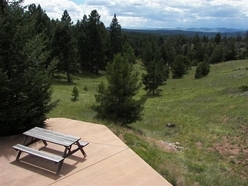 Elk Meadow Cabin is a property that has no covenants, is zoned for agricultural use & borders the Florissant Fossil Beds National Monument, a large expanse of government land, on its west boundary. Its 40 acres are 100% usable, have ample privacy & numerous trails for hunting, hiking, mountain biking or other outdoor activities - the perfect setting to bring your horses up for a scenic ride, enjoy the abundant wildlife or simply relax by the fire. Appreciate the alpine timber, stunning views of the snow capped Sangre De Cristo Mountains and the open valley filled with grazing elk, mule deer, wild turkeys and occasional brown bear from the quaint 1300+ SF cabin. The cabin’s lower level has a master bedroom, private bath and office / sitting area leading to an outside patio. The upper level has vaulted ceilings, spacious galley kitchen, living room with wood burning stone fireplace and adjoining dining room / sun room. The property has a detached garage other small outbuildings that could easily be converted to a tack room / equestrian storage unit, ATV/bike storage, a studio, workshop, etc. Nearby Mueller State Park, Pike National Forest and BLM Lands offer additional outdoor recreational opportunities. World class skiing, fishing and river rafting are within 1 hour of the property. 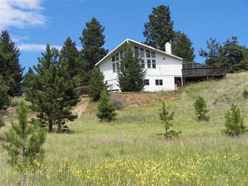 Find your Colorado mountain escape at the Elk Meadow Cabin – a truly private mountain hideaway only 1 hour west of Colorado Springs! Enjoy your on-line tour of our featured Sports Afield Trophy Properties in the Central Colorado Mountains! All Information presented on this website is deemed reliable by True West Properties however its accuracy or completeness cannot be guaranteed. Prospective Buyers should independently verify all information. True West Properties welcomes the opportunity to work with outside Cooperating Brokers. Copyright 2019 True West Properties. All Rights Reserved. The text, images, graphics, sound files, animation files, video files and their arrangement on True West Properties internet site are all subject to copyright and other intellectual property protection. These objects may not be copied for commercial use or distribution, nor may these objects be modified or re-posted to other sites.